When John Marshall discovered gold while building John Sutter’s sawmill near Sacramento in 1848, he triggered the California Gold Rush. In the following years, prospectors invaded the mountain ranges that crossed the Chihuahuan, Sonoran and Mojave deserts. They left abandoned mines, tailings, rusting shovels and pans, gloomy cemeteries, ghost towns and legends as their legacy. Although thirty-two states have recorded significant commercial gold production, the highest yield areas have been located within the western states. 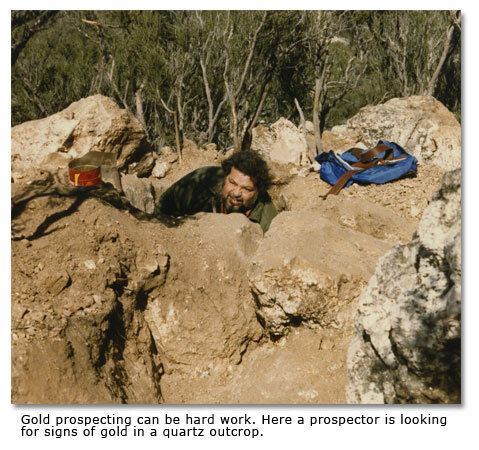 The recreational gold prospector can find gold in the deserts and mountains of the western states, taking note of the history of prospecting in the region. One of the most famous prospectors of the past, “Pegleg Smith,” traveled throughout the Anza Borrego desert region in southern California. Pegleg found some black pebbles on top of a butte in the Colorado desert. Thinking they were copper, he carried them to Los Angeles, where he discovered they were actually gold. Many believe that the area where Pegleg found the gold now constitutes the Ocotillo Wells California Vehicular Recreation Area. We made a video on gold and the Ocotillo Wells SVRA that may interest you. How Did Gold Get Here? Gold, a part of the primal stew of elements that gave birth to our planet, settled well below the surface. With the passage of time, some gold came into contact with ground water that had been heated by molten rock. 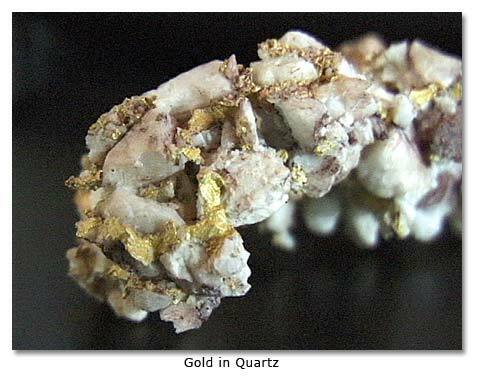 If pressures were high and the geochemistry was right, the gold, as well as other minerals like quartz, galena and pyrites, dissolved into the water. Superheated, the water, laden with its burden of gold and other materials, surged upward, driven by pressure toward the surface. It intruded into the fractures and folds of fault zones, contacts between differing rock types, openings of porous rock formations, and other cavities near the surface. As the heat and pressure diminished, the water yielded back to the earth its load of gold and the companion materials, which precipitated out of solution to form veins, or lodes. Where water flowed rapidly into large openings, and where temperatures and pressures dropped rapidly, the gold precipitated out of the solution quickly, often in the form of fine grains. When the water flowed into small openings, where temperatures and pressures fell less rapidly, the gold precipitated more slowly, as larger nuggets. 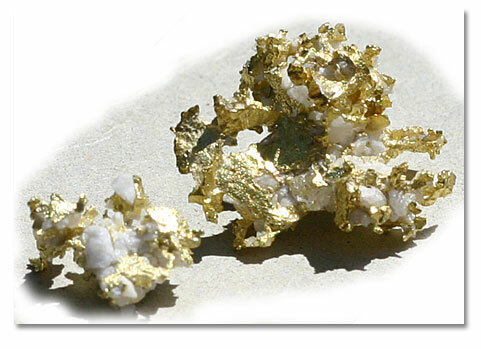 Over long periods of time, the gold, freed by erosion or disintegration of its host rock, moved into washes to be transported downstream as flakes or grains or nuggets by the flow of water. Gold particles in stream deposits are often concentrated on or near bedrock, because they moved downward during high-water periods when the entire bed load of sand, gravel, and boulders was agitated and moving downstream. Due to their weight, the fine gold particles collected in depressions or in pockets in sand and gravel bars where the stream current slackened. Concentrations of gold in gravel areas are called placers. Although they probably did not understand the geologic processes that delivered gold to the earth’s surface, many early prospectors, often possessed by their dreams of a rich strike, knew enough to search the deformed and fractured rock of faults, contacts between strata, cavities of geologic formations, bed-rock exposures, and sand and gravel bars of streams across the desert basins and mountain ranges of the Southwest. 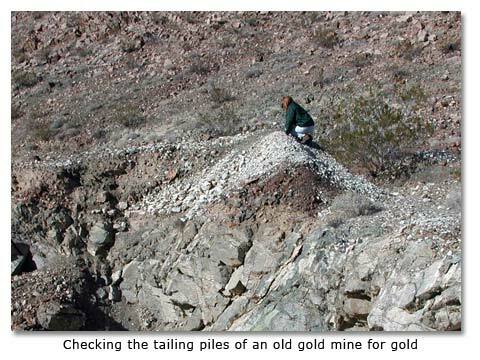 If you are interested in prospecting for gold, you can follow in the footsteps of those early prospectors. You will likely find that the most immediately rewarding places will be possible placer deposits in the sand or gravel bars in washes downstream from known lodes. You will need no more than the simplest of the prospector’s toolsa shovel and a pan. Next page - How Do You Pan for Gold?